Extreame Savings Item! 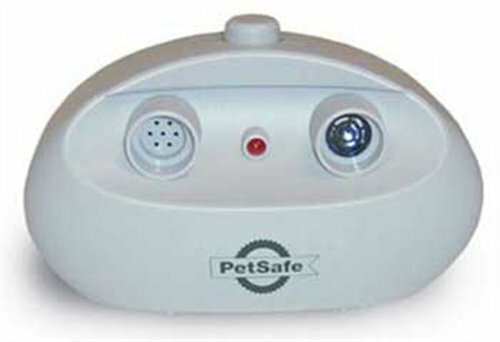 Save 44% on the PetSafe Indoor Ultrasonic Bark Control, Up to 25 ft. Range, No Collar Needed, Anti-Bark by PetSafe at Carrie J Keenan. MPN: PBC-1000. Hurry! Limited time offer. Offer valid only while supplies last. The PetSafe Indoor Bark Control is a tabletop device that automatically stops your dog’s barking, giving you peace and quiet in your own home. The PetSafe Indoor Bark Control is a tabletop device that automatically stops your dog’s barking, giving you peace and quiet in your own home. Simply put it on a table or counter in the room where your dog barks the most. Whenever your dog barks, all pets within range will hear a 2-second ultrasonic tone. You can can set it to go off automatically every time your dog barks or manually press a button to make the tone sound. Your dog will learn to associate his barking with the unpleasant high-pitched sound that's inaudible to most humans. Most dogs bark less within a few days. The device covers 25 feet, about the size of 1-2 rooms in a typical house. Add an extra unit for larger rooms or one unit for each room in your home. If your dog barks throughout your home, consider a bark collar instead. Ultrasonic bark correction is often the best bark control solution for many dogs. However, it will not work for all dogs because of factors like age, hearing ability, and temperament. When setting up the device, make sure there are no obstacles between the dog and the device. Also, make sure that the speaker is less than 10 feet high and is facing the direction of the barking dog. Uses high-frequency ultrasonic sound to disrupt nuisance barking- no bark collar needed. Table-top or hand-held use. Works on all dogs within hearing range. Range up to 25 feet. Sound sensor detects bark. Water-resistant. For indoor use only. Uses 1 9-volt alkaline battery (not included.) Average battery life is 6 months depending on how often the dog barks. Low-battery indicator. Measures 5” wide x 3” tall x 2 ¼” thick. Best use tips: Face the front of the device towards the dog. Make sure there aren't any large objects between the device and the dog. The sound doesn't travel well through fences, trees, or walls. Don't use this bark control device on dogs who are deaf or hard of hearing. They won't respond to the ultrasonic tone. Turn off the device when not in use. This helps prevent dogs from becoming desensitized to the sound. Add additional units to cover rooms larger than 25 feet. Don't use this product outside your home. The ultrasonic sound will bounce differently outdoors. To improve battery life, turn unit off when not in use. If you’re not sure which bark control product to choose, contact our Customer Care team Monday through Saturday and we'll gladly help you decide. No Bark Guarantee: Some dogs may not be responsive to ultrasonic correction. If this product is not meeting your needs, please contact PetSafe Brand. PetSafe brand has been an industry leading US manufacturer of pet behavior, containment and lifestyle products since 1991, helping millions of people and pets each year. Call, chat or email the PetSafe US-based customer care specialists six days a week.